Fanny's been on the homestead for a while now and one thing she's never managed to get done is the addition of a little culture and some manners! Well, she's determined to stop that now as she gets all schoolmarm on us and the animals and drags everyone up to her level! First up, the ubiquitous popup! That'll start of a series of 5 missions, one wrapper and a mission on Monday (all details HERE) and a four step build (and Deco Storage base) the Gallery (all details HERE). 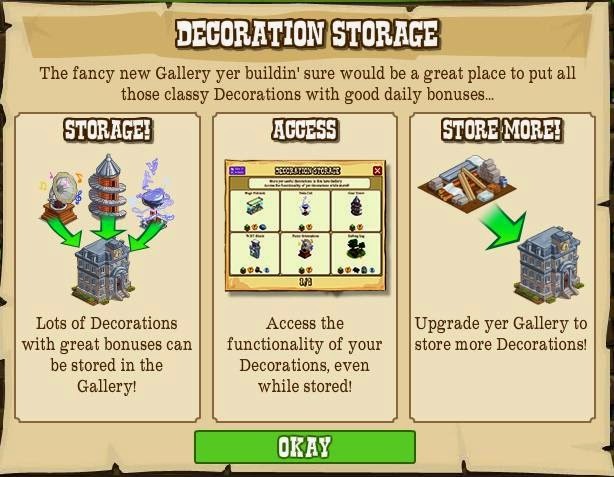 The Gallery will have the much awaited Decoration Storage menu and work like the Warehouse, we'll start out with 5 slots from just being placed, with more slots being opened as the missions are done, ending in a base of 20 Decorations stored. More will then come over the weeks as mission rewards! I know what you're thinking, but take a moment and, as the Guide says... Don't Panic! You see the studio have been very interested in talking to us about why many found Free Range confusing and have made a lot of changes for us, so consider this Free Range Lite! First up, there's no more of different animals or crops for different players... We'll all use the same five Uncultured Animals, the Chicken, Goose, Ox, Horse and Duck! 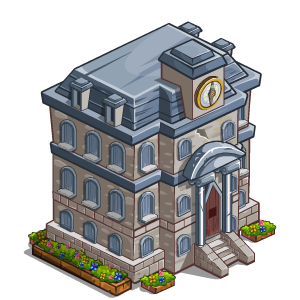 The Chicken and Ox will be coin purchases, the others will be Free Gifts. They'll then become Free Range, drop some awesome goodies like Free Gift Crops and Boosts along with counting as 8, yes EIGHT tends of the normal type of animal! We'll also be using the same two crops, one a coin purchase that's used to feed the Chicken, Goose and Duck (Green Tea) and the other a Free Gift that is used to feed the Ox and Horse (Cheesemakers). So no mission varieties, we'll all be feeding the same stuff to the same animals for the same missions! One thing still around is the feature of helping neighbours and speeding up the feeding of the Free Range Animals, but has also been simplified. 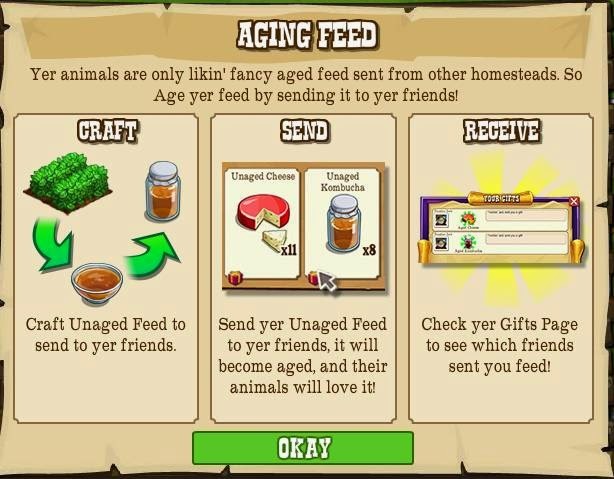 We craft Unaged Feed (details in the mission windows) and then send it to neighbours where it becomes Aged Feed, which counts as 4 tends towards the animals! 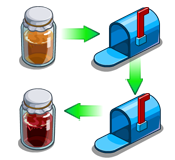 That's also been streamlined a bit, the Aged Feed won't need "opening" because we all use the same stuff, so we just find it in the inventory and use it like a boost. They've also changed the Gift Box slightly to make it easier to spot when friends have sent the items as they'll show up at the top of the Gift Box when you log in so it's easy to see who was the generous friend! ...so lets get going and get those decorations stored!